Free to download. A collection of seven cards demonstrating the invisible work ongoing at the European Marine Energy Centre (EMEC), in the Orkney islands, Scotland – the world’s first grid-connected test site for wave energy and tide energy – and the place where I have been working since 2003. 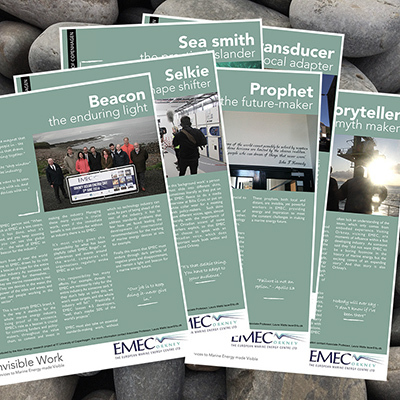 Seasmith, Prophet, Transducer, Storyteller, Beacon, Selkie: Each card personifies one service provided by EMEC. Each is a ‘living technology’ of social and technical expertise that makes the test site work, alongside the better-known technology infrastructure. This expertise is usually invisible, but is essential to both the test site, and the future of the marine energy industry as a whole. These cards and their insights were developed by myself and my research assistant, Rebecca Ford, as part of a specific collaboration with EMEC during October-December 2014. Thanks go to everyone at EMEC (and beyond) who helped us with this piece of research and, of course, to everyone in Orkney who has helped me understand how future-making is done in the islands.